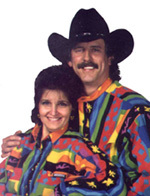 We are country western couples dancers in the UCWDC Showcase Diamond division. We are from New Jersey-we like to say Western New Jersey. We dance at the UCWDC events in the East coast area and have been to The Big Apple, Easterns, Baltimore, Northeastern, New Orleans, Harrisburg, Colorado, New Mexico, Arizona and Worlds competitions. We usually dance at least 5 and sometimes 6 of the dances offered at all competitions, which are Polka, Cha Cha, 2-Step, Waltz, East Coast Swing and West Coast Swing- and now Night Club Two Step and Norfolk (Triple two) have been added. See several dance photos. Showcase dancing is a professional style, choreographed to pre-released music, which shows musical and lyrical interpretation. It includes more theatrical arts and ballet type moves than are allowed in the Classic divisions, which are social style orientated. Note that by style, we are talking about the type of choreography and movement. In other words, it is which moves are done, not how, that seperates Showcase from Classic. Diamond Showcase is the over 40 division. What is the UCWDC? The United Country Western Dance Council, the biggest group of country dance event directors in the world. Events are held most weekends somewhere in the world. Their Home Page has plenty of dance links. We teach country western dancing at the Colorado Cafe in Watchung, NJ. The Colorado Cafe has a very large floor-about 4000 sq. feet, a restaurant, and has large screen TV's set up so you can watch your favorite videos if you don't want to dance! It is the best country western dance club in the Northeast, and is one of the few still doing well. We also teach various adult education classes in the Flemington and Watchung areas, parties, workshops, etc. Glenn has an interest in history, especially the American Revolutionary War. He is a the commander of Outwater's Militia, a revolutionary war re-enactment group, portraying the militia of Bergan County, the Dutchmen of the Neutral ground who fought against the loyalist and British raiders from New York City. He writes most of the web pages of our site, doing research and reading everything he can. He is also a descendant of John Hart, signer of the Declaration of Independence. You will find an outline biography of the signer if you follow the Link. with over 20 pages of battles from large to very small, places, people and areas of NJ, and various documents and accounts of the Revolution. I recommend also Outwater's Militia web page. "The reproduction of any part of this website and its contents without the express written permission of the author is strictly prohibited and protected by US and International Copyright law."